Mimosas are astonishingly, ridiculously, exceedingly, embarrassingly easy to make. Not that simple doesn’t taste yummy and easy won’t add the sparkle you’re looking for:) The flavors are splendid! I promise you a cool drink that will deliberately take care of the mood. Add 1 tablespoon of grenadine syrup in each flute. Combine cranberry juice and champagne together and fill up the flutes almost right to the top. Garnish with rosemary and drop the berries right before serving. Hello beautiful people! Is it summer where you are? I spent my day running from one air-conditioned room to the other, trying to avoid the heat and humidity. My kiddos spent the day at the pool with the cousins swimming and playing in the sun all afternoon, when they got back I couldn’t but surprise them with this cool refreshing orange pineapple punch. Add some vodka inside and turn it into an adult party-wide hit punch!! Decorate with strawberry slices and orange wedges, and serve. Fresh strawberries and orange wedges, to decorate. Combine well the orange juice, pineapple juice, lime juice and honey in a pitcher. Taste and adjust sweetness. Add 7up or Sprite, right before serving and garnish with fresh fruits and paper straw. When I think of a refreshing and light drink to sip while watching the clock countdown to midnight, I make myself a red Moscow Mule. Pomegranate juice is a brilliant addition to the classic recipe. It’s a fantastic compliment to ginger beer while pomegranate arils make it pop up with Christmas colors. Holiday heaven! Mules has definitely been my favorite cocktail during 2015, it’s traditionally served in copper mugs, but apparently customers can’t stop snatching them from bars, that a lot of places are replacing their attractive cups with glasses. Still cool for me:) I love the ginger-spicy and pomegranate-sweet mixture and here I am celebrating tonight in style. Cheers everyone to a fresh beginning! Combine vodka, ginger beer, pomegranate and lime juice. Stir. Top with ice cubes or crushed ice if desired. Garnish with pomegranate seeds and mint and enjoy. Four years ago I started a blog thinking that this will be a great idea to document all my favorite recipes and have them all in one location. This idea developed since tremendously and instead of a cooking book, I ended up with an address book filled with contacts of friends from all over the world. I’m blessed to have so many followers and so many clients interested in my cooking and work as a food stylist. It’s this Blog that took me this far! I had people assisting me on shoots just because they know “Maya’s Ingredients”, I met fresh graduated photography students who knows my name because I was introduced to them as part of their course at college and I was invited to speak about Food Styling and Food Blogging at several events and TV shows because my Blog and website made it so easy for every one to find me and view my work. I’m thrilled, …no overwhelmed:) I’m happy and I will have a toast to you, thank you for passing by and hope to see you often. This elegant drink can be put together in 3 quick steps. Serve it in martini glasses or shot glasses and say CHEERS! Preparation Combine vodka, espresso and Tia Maria liquor into a shaker filled with ice and shake well. 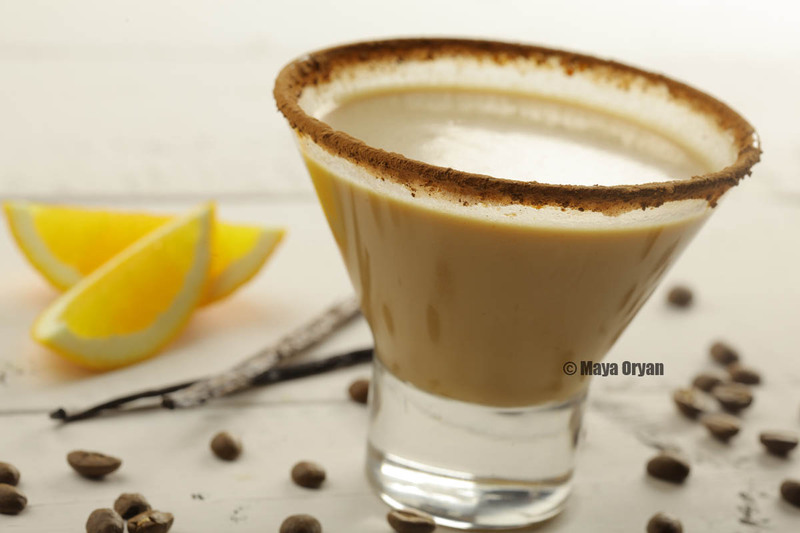 To serve, rub the rim of a martini glass with an orange wedge and dip into the cocoa cayenne mixture. Pour drink inside and enjoy. Cheers! When I was living in Dubai, I never ran out of passion fruit. It used to be available all year round and at a very reasonable price. During the decade I lived in the UAE, I tried passion fruits in baking, in desserts, in juices, in smoothies and it has quickly became one of my favorite exotic fruits. Until I moved to Lebanon, I never found nice, purple, juicy passion fruits, and if I do find in the imported fruits section, it will not be for less than 25$/per kilo!! Yesterday I got lucky with some local, organic passion fruits, smelling like heaven. Finally we started to grow them locally and the price dropped to 2$/per kilo. I hurried home to make my most refreshing passion fruit lemonade recipe. Summer is here and it’s very hot! Freshly squeezed lemon juice and passion fruit pulp, came to my rescue in this hot climate, tasting like an exotic vacation in a martini glass. 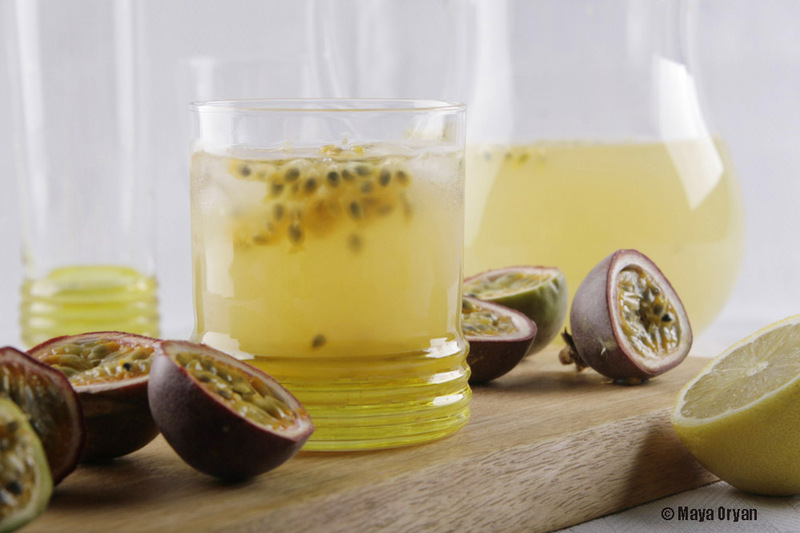 For a lazy version, buy fresh lemonade and scoop out pulp of passion fruits inside your glass. I’m sure this soon will become a hit at your parties. Smile and cheers! In a jug, combine water and lemon juice and stir in sugar until dissolved. Scoop out pulp of the passion fruits with a teaspoon and stir it in. Add ice cubes if desired and serve.